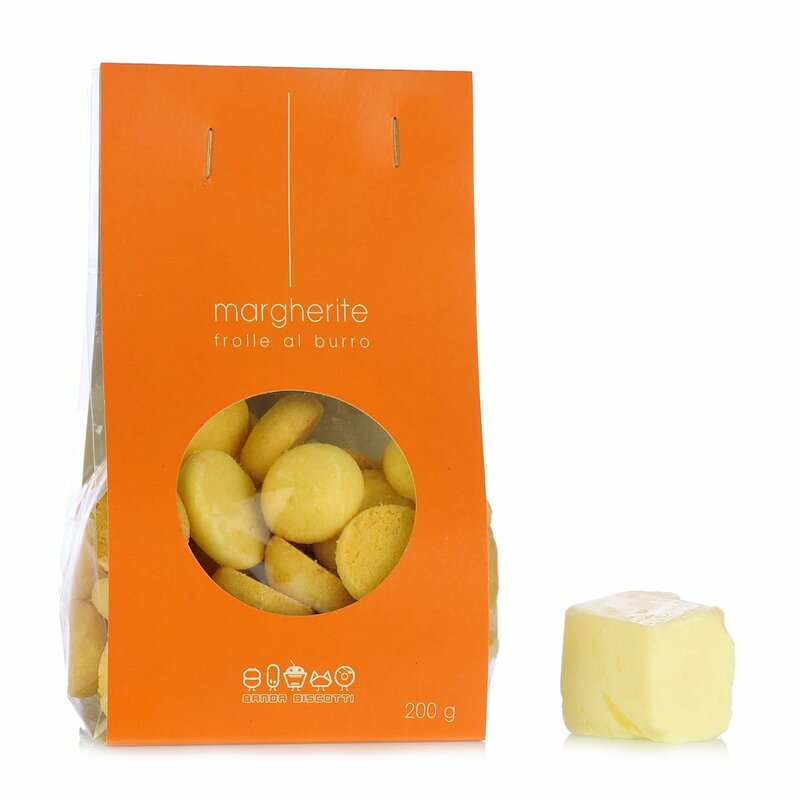 Margherite are delicate short biscuits made by Banda Biscotti. Only simple ingredients are used to make these biscuits, with a traditional recipe and a strong desire to get back into the action: Banda Biscotti is engaged in the social rehabilitation of prisoners. br> Try them with a nice hot cup of tea: their sweetness is the perfect companion on days when you feel you need coddling. Ingredients 00 wheat flour, butter, icing sugar, egg yolk, potato starch. ALLERGENS: Cereals containing gluten; Eggs and derived products; Milk an derived product; traces of nuts - almonds, hazelnuts, walnuts, cashew nuts, pecan nuts, Brazil nuts, pistachios, Macadam For more information on product labels, please contact our Customer Service department. The information on the labels of the products may vary for reasons beyond our control, therefore, there may be discrepancies between the information on the site and that on the products delivered. Please always check the information on the product before consumption or use. Banda Biscotti makes delicious handcrafted delicacies based on the hard work and enthusiasm of the inmates of the prisons of Verbania and Saluzzo. There's a special history behind each Banda Biscotti product derived from the production staff, each of whom has a unique and personal story to relate. So enjoying these confections becomes something more than satisfying a simple pang of hunger: it's also a gesture of care for society at large and our loved ones.